So, writing the answer post last night got me thinking a bit, and I decided to start using a new tag on this blog: free-form reading. Going to use this for readings that are meant to be more in-depth/focused than the 'quick draw' or 'day draw', ie. just randomly pulling a few cards, but in which I do not use any kind of formal spread and let the cards just sort themselves out as they will. As I wrote, with certain decks I sometimes like not being beholden to any predetermined card positions, and figured I might as well systematize that a bit here. That said, I decided to do such a reading to get some advice about an idea I've been pondering - restarting the Arabic writing blog I hate created over the summer and abandoned soon thereafter. A fairly unconventional portrayal of the Emperor, wearing a dress and a mask. His real face is turned away, gazing towards the background. We see there a silhouetted scene, a two sides of a precipice connected by a carefully constructed bridge. It was proper planning, organization and management that allowed that bridge to be built. Now he leans on a sword, something to steady him as he looks beyond the horizon, still supervising. The Queen of Cups, like the rest of the courts in this deck, is freed from the constraints of typical imagery. There are no thrones for these folks, no horses or chariots. Instead we see more natural habitats. The Queen is depicted under water, as comfortable beneath the waves as most people are above them. She carries a cup, unselfconsciously enjoying herself, being where she belongs. Writing has long been my comfort zone - the thing I feel I am good at, the best way to work through complicated thoughts and emotions, me at my most eloquent. Apparently this extends to all languages - when I studied French I liked writing essays, and even in Polish, where my spelling is rather terrible...what I write tends to sound far more sophisticated than my typical speech. I like writing, learning, challenging myself intellectually. Intuitively, this does feel like a good idea, something I want to do. Whereas the majors in the Silicon Dawn by and large hew to the RWS tradition, the minors are quite noticeably more Thothy - a common theme in several Thoth inspired decks, come to think of it... 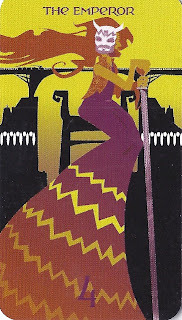 In any case, the image here very much calls back to the 6 of Cups in the Thoth, titled Pleasure. We see a figure, half woman half sea serpent, her upper body in almost the same posture of enjoyment as the Queen. The cups here vary - beer pitchers, water glasses, coffee mugs; it all mixes together below. Pleasure can take many forms - the crux is her, at the center, reaching towards the light. In terms of how to approach this project, this card advises me not to take things so seriously. Yes, in the grand scheme of things it is about building language skills, being methodical and organized in my learning, the understanding that if you really want something it is about more than just the time you spend in the classroom...but that basis does not mean I have to be Super Serious in how I go about it. It is not, after all, homework. It is not an assignment of any sort. The Arabic blog is for me, and we all know it is much easier to stick to doing something if you actually like doing it. The reason I am still writing in this here tarot blog is because I enjoy blogging about tarot cards. So if I want to rant about the world, if I want to write silly short stories and fictional character studies, if I want to write about tarot cards even (which is another idea that has definitely crossed my mind), I can. I can include pictures, prompts, whatever. This is for me, and why not be as silly and random and self-indulgent with it as I want? As long as I am writing, I am doing things right. Tentative then, both my abilities and my confidence or comfort with them, but perhaps more solid than I think. Perhaps solid enough that I can engage in a writing blog where I am accountable to no one but myself, where I can go on about anything at all just because I want to. Perhaps it is time for me to take the leap and commit myself to trying. Let us rush and fall and fly. Or sign up for a word of the day email and translate that to Arabic thoughts? Or use a deck of playing cards and work on numerology? I've had seven blogs, four of them provided a way to get something done or something out of my system. those are some good ideas Sharyn. Thanks!